Can Mindfulness Meditation Reduce Belly Fat? Mindfulness and meditation are known to improve psychological health, but how can being present actually change your body fat and help you lose weight? The answer lies in the psychological aspects of weight gain and eating habits. Mindfulness has been shown to lower binge eating, emotional eating, and weight loss. Here's some more information about how mindfulness can help your lower belly fat and lose weight. 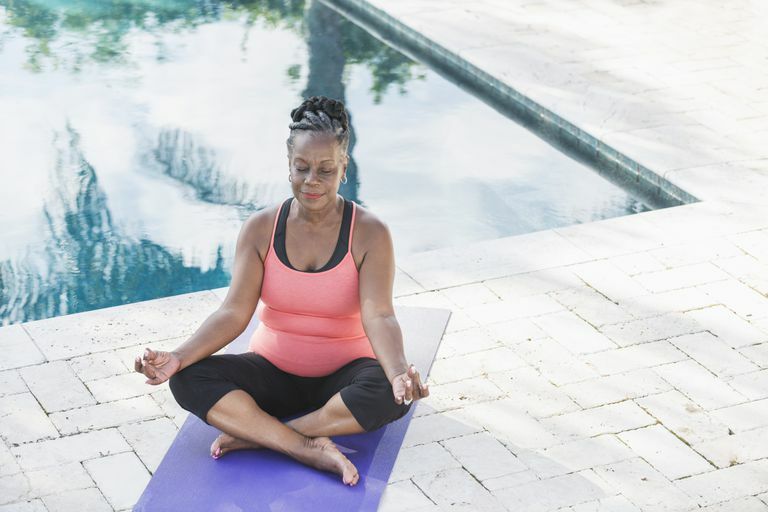 While you may associate strenuous physical activity to lose fat, mindfulness research shows that consistent meditation can actually lower belly fat. Published in 2011 in the Journal of Obesity, the study took a small group of 47 overweight or obese women (with an average body mass index of 31.2) and gave half of the subjects a series of classes on mindfulness meditation techniques. These sessions included coaching on paying attention to sensations of hunger, food cravings, identifying emotional eating triggers, becoming aware of negative emotions, as well as advice on self-acceptance and forgiveness of others. Guided meditations were offered to introduce new mindful eating skills, like paying close attention to a sense of taste and eating much more slowly than usual. In total, the study group got nine two-and-a-half-hour classes and a silent retreat day in which they were encouraged to practice their new meditations and mindful eating skills. They were also encouraged to use the mindful skills at home in assignments of up to 30 minutes a day, six days a week, as well as before and during meals, and to log their mindfulness activity. Both the study and control groups were given a two-hour nutrition and exercise information session. By the end of the study period, all participants were measured for abdominal fat distribution, as well as blood cortisol levels. Two main outcomes were examined: first, did the mindful eating and stress reduction program reduces emotional eating? And second, did it affect the amount of belly fat in the participants? Emotional eating improved: Overall, the participants experienced less anxiety, less eating in response to emotions and external food cues, as well as a greater awareness of bodily sensations. Cortisol levels and belly fat: Blood levels of cortisol were lower in the treatment group overall when compared with the control group, though not significantly so. When only the obese subjects were analyzed, however, the lower levels were significant; that is, cortisol levels were significantly lower than the control group when only obese participants were examined. In addition, the participants who had the greatest improvements in mindful eating, who were more aware of their hunger sensations and more successful at lowering chronic stress, had the largest reductions in abdominal fat — up to more than 500 grams, or just under one pound, during the four-month intervention. This loss of fat in the belly region happened even without a change in body weight. The obese subjects in the control group, by contrast, gained weight on average during the study period. Jennifer Daubenmier, Jean Kristeller, Frederick M. Hecht, Nicole Maninger, Margaret Kuwata, Kinnari Jhaveri, Robert H. Lustig, Margaret Kemeny, Lori Karan,and Elissa Epel. “Mindfulness Intervention for Stress Eating to Reduce Cortisol and Abdominal Fat among Overweight and Obese Women: An Exploratory Randomized Controlled Study.” J Obes. 2011; 2011: 651936. Nicole Vogelzangs, Aartjan T. F. Beekman, Yuri Milaneschi, Stefania Bandinelli, Luigi Ferrucci, and Brenda W. J. H. Penninx. “Urinary Cortisol and Six-Year Risk of All-Cause and Cardiovascular Mortality.” J Clin Endocrinol Metab 95: 4959–4964, 2010. Should You Spice Up to Slim Down?